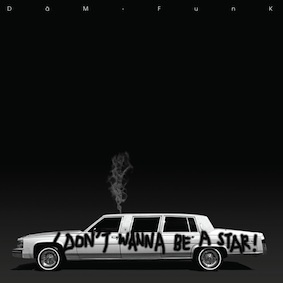 Dam-Funk's first new tracks leading up to his next album Invite the Light are now released on the 12" maxi-single "I Don't Wanna Be A Star". The record contains two vocals - the title track and the Prince cover "17 Days" - and two instrumentals. Record cover by Freddy Anzures. Stones Throw have announced a new EP from DâM-FunK. I Don’t Wanna marks FunK’s first solo release of 2012; earlier this year he collaborated with fellow West Coaster Ariel Pink on a cover of Donnie Emerson’s ‘Baby’. You can stream that here. This design is an homage to the classic Prince "1999" LP art and tour t-shirt, designed by Freddy Allen Anzures. Printed on the back are lyrics from the vocal version of Dam-Funk's "Hood Pass Intact". 4-color and spot screen printing technique used on ProClub Heavyweight T-shirts. This T-shirt body is known for its longer sleeve length & fitted collar. ProClub's are a staple in Dam's wardrobe.